A wedding, a honeymoon, and three wedding receptions are finally done. It’s a little bittersweet, to be honest. I’m excited to be done with all the stress of planning. I’m excited to take time to settle into our house, unpack the rest of my boxes, find the perfect spot for our wedding presents, just bask in the everyday adventure of being newlyweds. But celebrating with our friends and family has been such a joy to me. Sometimes it’s easy to forget how many people love me when I don’t get to see them often, but throwing three wedding receptions reminded Beau and me of how blessed we are. We have so many loved ones we needed three parties to accommodate them all! While our receptions provided a lovely and needed reminder of how great the people are in my life, seeing my long-distance friends also reminded me of how hard it is to maintain long-distance relationships. I have best friends in Australia and in Canada, in Washington, Colorado, Wisconsin, and Florida. At our first reception, I reunited with my best friend and step-cousin, after almost seven years. This past weekend, I reunited with one of my au pair besties for the first time in more than three years. I only show mine and Beau's faces, not those of my friends and family. Les filles de 78! It’s been just as difficult seeing my best friends who couldn’t attend either reception. 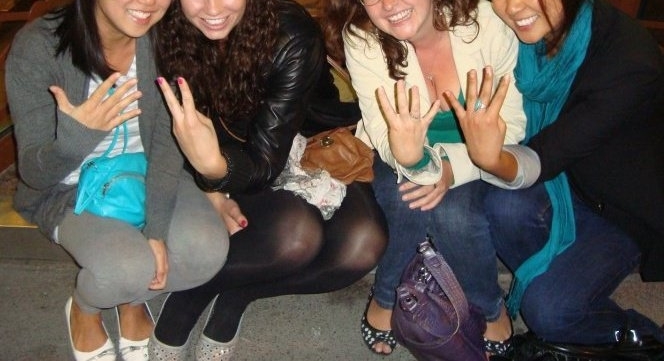 My other two au pair besties I haven’t seen since July 2010 and October 2010 (Canadian and Australian, respectively). I haven’t seen one of my college best friends, a fellow French major who taught English in France while I was an au pair, since October 2011 at Homecoming. Now I live in Small City, and I remind Beau more often than he’d like that we can’t live here forever. I’m slowly turning acquaintances into friends, and I do love his family. Game Night is the highlight of my week, with the occasional Friday night wine tasting coming in at a close second. Our house is the BEST, and the city is charming. But seeing all of my friends this past month was a stark reminder of what I don’t have anymore. While I do have Lauren and Hardy in Big City, less than two hours away, it’s not the same as living down the street from Lauren. It’s not the same as seeing the au pairs every single day. It’s not the same as spontaneous tea parties and midnight trips to Jack-in-the-Box. So while I’m glad not to be stressed out with wedding planning, I’m sad that I don’t know when I’ll see all my friends again. It could honestly be years, and that’s hard for me to acknowledge. Luckily for me, I’m actually spending the rest of the week with Lauren and Hardy! Beau and I spent last night with them, and I drove Beau to the airport this morning. Instead of going back home, I’m working in the actual office all week and hanging out with besties every night. Then Saturday, Lauren and I will cheer on Hardy as he runs a half-marathon! It’s almost like the glory days from when Lauren and I were roommates! Well… this blog post took an unexpected turn. I didn’t intend on writing such a melancholy post for Wedding Wednesday, but sometimes you don’t realize what you’re feeling until you write it all out. 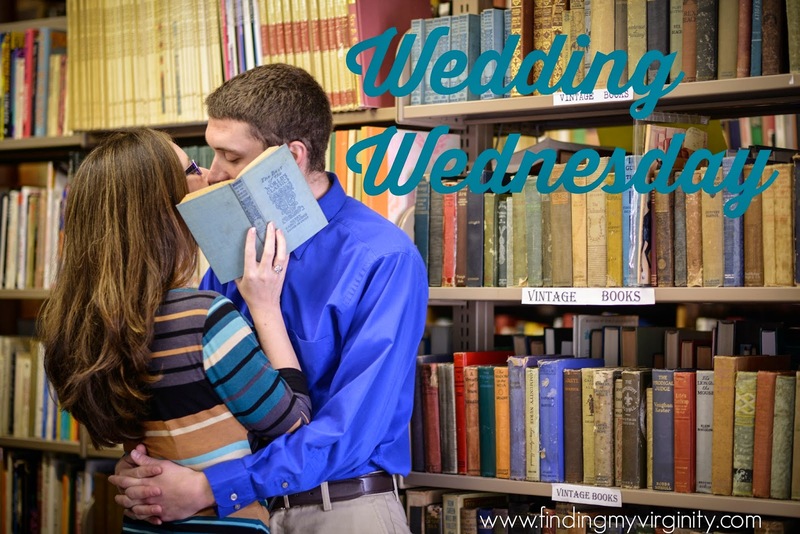 Linking up with Nancy J, Meredith, and Ashlen for Wedding Wednesday! Linking up with One Tipsy Chick for The Wednesday Roundup. I totally understand! While I'm happy the stress is over, I miss the anticipation: to get married and live the dream I've had forever, to see friends from across the country who I never see, to dance with family members, etc. It's sad knowing that I don't know when I will see all of those people again...and knowing I will never see them all in once place again. Worlds colliding is so fun until it's over!!! I totally hear you! we will move back to England eventually, but sometimes missing my friends there sneaks up on me really unexpectedly. And once you're in England, you'll miss your friends in the States. Having friends worldwide is a mixed blessing. Obviously it's great to have so many loved ones, but it's so hard to always be away from them.